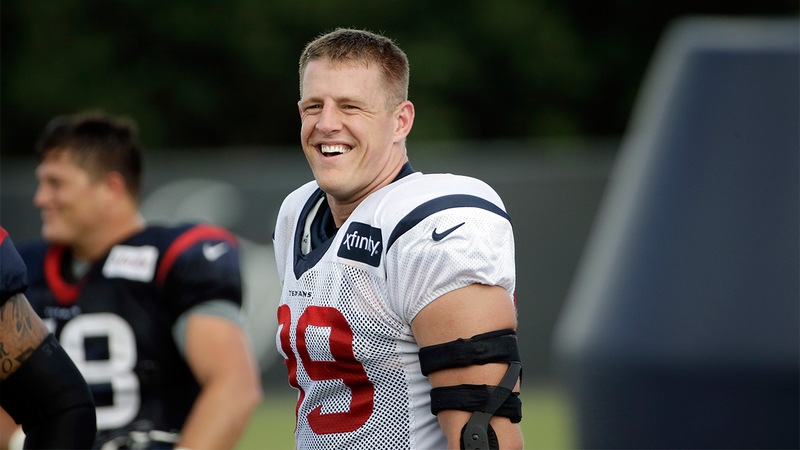 NEW YORK -- Houston's J.J. Watt was a unanimous pick at defensive end for this season's team, as was Minnesota running back Adrian Peterson. Khalil Mack has made All-Pro history. Mack's versatility and relentlessness earned him selection at two positions on the 2015 Associated Press All-Pro Team, an NFL first. The second-year Oakland Raiders defensive end and outside linebacker drew enough support Friday from a panel of 50 media members who regularly cover the league to make the squad both spots. "I do whatever I can to help the team win. I'm a team guy," said Mack, who had 15 1/2 sacks (five in one game), behind only Watt in the league. "Whether it's dropping in coverage or rushing the passer. I can do either. I think they (voters) saw that." What the voters also saw was the superb work by the Carolina Panthers. Carolina, with an NFL-best 15-1 record, had the most All-Pros with six: quarterback Cam Newton, fullback Mike Tolbert, center Ryan Kalil, linebackers Luke Kuechly and Thomas Davis, and cornerback Josh Norman. Kuechly led the Panthers contingent with 49 votes. "He has fulfilled everything we thought he could be," Panthers general manager Dave Gettleman said of Newton. "And he's just had a great year. Again, the franchise quarterbacks make everybody better - that's what they do." Newton was especially happy to join Kuechly on the team; the linebacker has made it in three of his four pro seasons. "That's big, man," Newton said, adding with a laugh, "I'm just trying to be like Luke Kuechly man, that's it - Captain America, man. He sets the tone." Five teams - New England, Pittsburgh, Cincinnati, Arizona and St. Louis - had two All-Pros each. Steelers receiver Antonio Brown drew 49 votes; teammate David DeCastro made it at guard. The Patriots were tight end Rob Gronkowski and kicker Stephen Gostkowski. From Cincinnati, it was DT Geno Atkins and OT Andrew Whitworth. Arizona, in a measure of the strength of its secondary, had cornerback Patrick Peterson and safety Tyrann Mathieu. St. Louis' All-Pros were DT Aaron Donald and punter Johnny Hekker. One rookie, Seattle kick returner Tyler Lockett, was selected. "It means a lot," Lockett said. "There are a lot of great players who come in to the NFL and do an exceptional job and have a great career, but they're never able to make it on the All-Pro team. It's nothing that they did, just other players may have had a better season. To be a rookie to be able to come in, it's a crazy experience and a crazy accolade to have." In all, 15 NFC players and 12 from the AFC were chosen. The other All-Pros: Tampa Bay RB Doug Martin, Atlanta WR Julio Jones, Cleveland OT Joe Thomas, Baltimore G Marshal Yanda, Denver OLB Von Miller, San Francisco ILB NaVorro Bowman, and Kansas City S Eric Berry. For Berry, 2015 was a particularly special season. He was diagnosed with lymphoma and this time a year ago was undergoing chemotherapy. He returned in spectacular fashion, helping the Chiefs win their final 10 games this season to make the playoffs. "It's an incredible honor. It means a lot to me," said Berry, who also made the 2013 team. "Football's a team game, so I have to give credit to those guys around me as well. We've been hungry from the get-go. I don't know how to explain it, but I think you see it throughout our play. I think our play speaks for itself." Bowman is another player coming off a courageous comeback from a major knee injury sustained in the 2013 NFC title game. He only returned to the field this season after being an All-Pro in 2011, '12 and '13. Newcomers to the team along with Mack and Lockett are Newton, Norman and Davis among the Panthers, plus Jones, Whitworth, Martin, DeCastro, Donald and Matthieu. "That's another goal check off my list," Norman said. "It really is. It went from Pro Bowl to All-Pro to hopefully Defensive Player of the Year. Sheesh. "That is all personal goals, though. The Super Bowl is the granddaddy of them all. I'm working so hard toward that right now. All of these other accolades will fall into place."